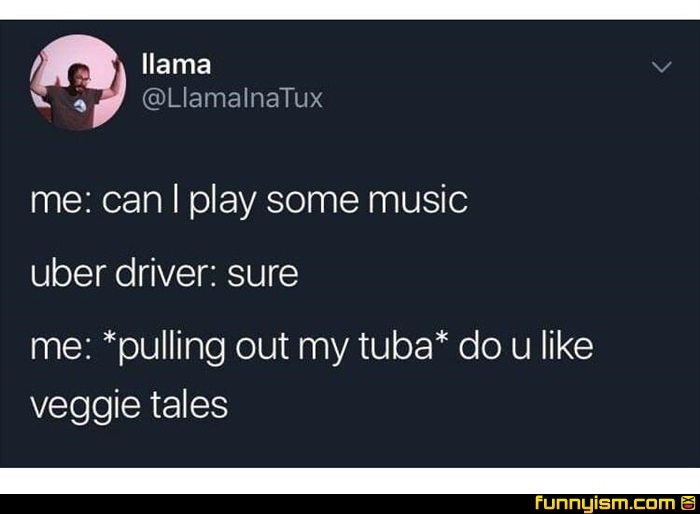 @Neil Dylandy, Veggie tales, veggie tales, veggie tales, ve-ggie-tales. @iLikeBigBooks, broccoli, celery, gotta be - VEGGIETALES! @PunnyBaker, cauliflower, sweet and sour, half an hour - VEGGIETALES! @Lysander99, There's never ever ever ever ever been a show like Veggie Tales! @SimonPetrikov, IT'S TIME FOR VEGGIE TAAAAAAAAAAaaaaAAAAaaaaAAAAaaaales! It beats the cRap they usually have playing. I always say “no music please” then stare at them in the rear view mirror. If they don’t talk, automatic 5 stars. What the hell did the uber driver do to you? @ThePandaPool , He found the uber driver's service exceptional and this is his way of saying thanks.